Our clients use the Respage Dashboard for so many things: posting, managing mutiple properties, reputation management, analytics and more. 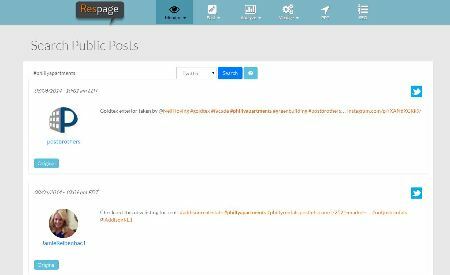 We have now added a new feature requested by clients – the ability to search public posts. Since they were already logged in to the Respage Dashboard and using it daily, users wanted to be able to easily search for public Tweets and Facebook posts by hashtag and keyword. This is a free new feature for all Respage Express Clients. Check it out and tell us what you think.